Seen against the background of the downturn in the National Economy the Namibian Mining Sector should be leveraged to strengthen the productive capacity of the entire economy. 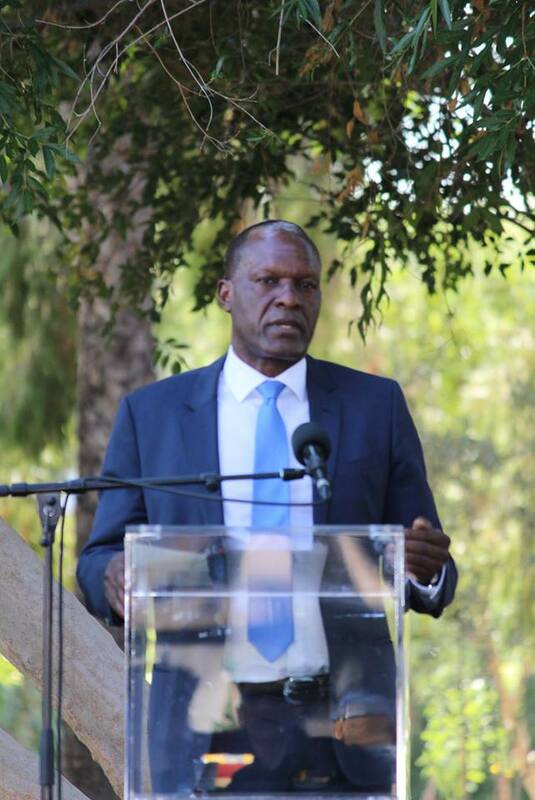 The Minister of Mines and Energy, Tom Alweendo addressed a Debmarine Namibia stakeholder meeting and asked if more should be done to add value to minerals before it is exported in raw form. Minister Alweendo aid given the fact that the public sector plays a rather dominant role in the Namibian economy it has created difficult challenges for government. H was of the opinion that it has created a situation where some people have become less hopeful, some have become demoralized. 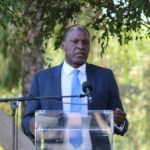 Minister Alweendo said while it is necessary to figure out what went wrong, his concern is that too much time is spent lamenting about the problem. It is indeed a pleasure for me to be here with you this morning and I would like to thank Mr. Otto Shikongo for having invited me to join you this morning. Events like these are important in order for us to share information and to learn from each other’s experiences. We have listen to an excellent presentation from Mr. Shikongo about what Debmarine has achieved over the years and its aspiration to remain a pivotal part of the Namibian economy. There is no doubt that Debmarine has contributed enormously to our economy. Today Debmarine is a world-class off-shore diamond mining company we all are proud of. With a direct workforce of close to 1000, and a number of contractors, Debmarine plays a crucial role in job creation for young Namibians. I am also told that the value of scholarships provided by Debmarine in the last 15 years, are in excess of N$280 million Namibian dollars. I encourage Debmarine to continue being an exemplary and innovative company in our mining sector. As we all know, mining is one of the most important sectors of our economy. In 2017 the mining sector contributed over 12% to our GDP, and it is expected that by 2022 the mining sector’s share of the GDP will exceed 152%. This high contribution to our economy suggests that for the foreseeable future, the economy will be dominated by the mining sector. Given the impact the mining sector has on the economy, it goes without saying that we need to take good care of the sector. We need to be pragmatic in the management of the sector. We need to ensure that the mineral resources are utilized to the benefit of both the investors and the State. Because of the importance of the mining sector, it is no surprise that the Namibian people, who are the real owners of the resources, have a heightened interest in the mining sector. They want to know how the mineral resources are being exploited and utilized. They have a legitimate expectation that the mineral resources be shared equitably. A common question that is being asked is whether the mining sector can do more for the economy. For example, can the mining sector be leveraged to strengthen the productive capacity of the economy as a whole? Can we not add more value to our minerals before they are exported in raw form? What about the mining industry sourcing locally produced goods and services as inputs in their mining activities? What about local ownership of the resources and the issue of economic empowerment. These are all important and legitimate questions to be asked. My general answer to these questions is that – yes indeed, all the above issues can be achieved. Yes, indeed the mining sector can do more. There is no reason why we should continue to export all our raw minerals in raw forms – some can easily be value-added. What is needed is a comprehensive dialogue between all the relevant parties that takes place in an environment of mutual trust. A dialogue that seeks to discover what is in the best interest of both parties. When that takes place it will be possible for both parties to discover, for example, that a successful value addition scheme is mutually beneficial to both the investors and the State. You will discover that value addition and the need to have an enabling investment environment are not mutually exclusive as some want us to believe. It has been proven that the two can be mutually reinforcing. Value addition will strengthen the productive capacity of the economy, thereby serving as a catalyst for more investment in the economy. I am happy to note that such a dialogue between the mining industry and the Ministry of Mines and Energy has been intensified and I am hopeful that soon we will come to a mutually agreed outcome. Let me say a few words about the future of the mining sector. One important fact thatwe must always keep in mind is that the mining sector will continue to be an important contributor to the economy only if we find new mines. This is so because given the non-renewable nature of minerals, the existing mines will come to a closure. But forus to discover new mines, a number of things have to happen. The first thing we need to do is to have a good understanding of our mineral potential. We need to have a good knowledge of what minerals are available. One often hears statements that Namibia is rich in minerals. I am of a view that we need to encourage more invest in a comprehensive geological mapping. Without an improved geological mapping, it will rather be difficult to attract investment for mineral exploration. Fortunately the emerging geological mapping technology has made it possible to obtain accurate mineral resource assessment. The second thing that we need to do is to do everything possible to attract investment in mineral exploration. Without exploration, no new mines can be discovered. We also know that exploration is a high risk investment. When you invest in mineral exploration there is no guarantee that you will discover minerals. It is estimated that the chances that an exploration will lead to a successful mining operation is 1:1000 and the lead time can be as long as ten to twenty years. In order for us to attract exploration investment, we need to do a number of things. One of the things we need to do is to periodically review our mineral licensing legal framework. This is necessary in order to ensure that we continue to be competitive in attracting investment, both local and foreign. For example, it is not helpful when it takes an inordinate long time for us to finalize the processing of licensing applications. It will be self-defeating when we impose impractical licensing conditions; or when our policies are unpredictable thereby creating policy uncertainties. Government expenditure has been curtailed such that some of the needed socio-economic activities had to be suspended or diminished. Our sovereign credit rating was downgraded by the credit rating agencies. So a number of not so positive events took place over the last two years. Given the fact that the public sector plays a rather dominant role in our economy, this has created difficult challenges for us. It has created a situation where some of us have become less hopeful; where some of us have become demoralized. Being human, we have also now started to identify the culprits to point fingers at. We want to know who caused these economic difficulties for us. While it is necessary to figure out what went wrong, my concern is that we seem to spend too much time lamenting about the problem. At some point we have to realize that things will improve only when all of us concentrate our efforts on finding a solution to our problems. I am in agreement that the Government must provide the necessary leadership in finding a solution and I believe that the Government is doing just that. However, the Government efforts will not succeed if not all of us are on board. Going forward in steering Namibia to the next level of development and prosperity, we also need to understand that in this 21st century things do not necessarily work like they used to anymore. We live in an ever-changing economic environment, where there is no sure script for success. But I also believe that we as a country are in a fortunate position where we were able to build a solid foundation on which we can build further. Among the number of urgent things that we have to do, is to unleash the creativity and brain power of our people, especially that of the youth. It is essential that we embrace and incentivize those with new practical ideas with a potential to result into new economic opportunities. We also need to agree to make ourselves reasonably uncomfortable by venturing into unexplored fields and doing things no one has done before. If we, as a collective, approach our challenges in the Harambee spirit and with creativity, innovation and courage, we should have nothing to fear for the future. Let me once again thank Otto for having arranged this event for us to exchange views. I wish you and your entire Debmarine team well in realizing your vision of becoming a global benchmark in marine diamond mining.